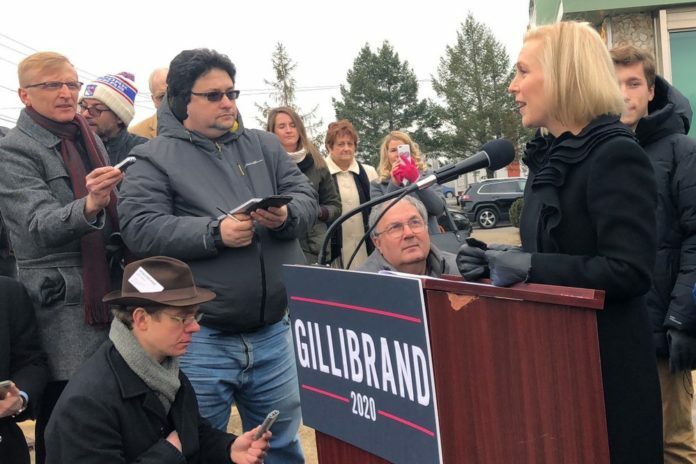 Speaking outside a Troy diner she said is “a stone’s throw” from her family’s house, Gillibrand framed the campaign as an extension of motherhood. “I’m going to run for president of the United States because as a young mom, I will fight for your children as hard as I would fight for my own,” Gillibrand, 52, said as she was joined by her husband, Jonathan, their 10- and 15-year-old sons, and her mother, Polly. But Gillibrand, who announced the creation of a presidential exploratory committee Tuesday on CBS’ “The Late Show with Stephen Colbert,” faces a series of hurdles. She won’t be the only woman seeking the White House — Sen. Elizabeth Warren of Massachusetts and Rep. Tulsi Gabbard of Hawaii have already jumped into the race, and several other prominent women are expected to soon follow them. And there are persistent questions about whether — more than two years after Hillary Clinton fell short of the White House — Americans have grappled with sexism and are willing to support another woman running for president. The first question Gillibrand received at her press conference Wednesday showed the scrutiny she and other women could face, as a reporter said a lot of people see her as “pretty likable.” The remark touched on a raging debate about why women in politics are held to a different standard than men regarding their perceived likeability. First appointed to the Senate in 2009 to fill the seat vacated by Clinton, Gillibrand has been among the chamber’s most vocal members on issues like sexual harassment, military sexual assault, equal pay for women and paid family leave. But she angered some fellow Democrats in November 2017 when she said former President Bill Clinton should have resigned after his affair with White House intern Monica Lewinsky. She was also the first prominent Democrat to call on her Senate colleague Al Franken to resign after accusations of harassment from multiple women. She defended her actions on Wednesday. While Gillibrand’s forceful advocacy for gender issues could help her stand out in what is expected to be a historically crowded field, she will also face questions about her ideological evolution. Gillibrand first ran for office in 2006, defeating a four-term Republican incumbent in a conservative congressional district, a victory she readily touts today. She was a centrist Democrat who joined the Blue Dogs and had an A rating from the National Rifle Association during her time in the House. She has abandoned many of those early, more conservative positions during her Senate tenure. Gillibrand has been among Congress’s most prolific fundraisers, raising more than $56 million during her career, including more than $20 million from 2013 to 2018, according to aides. That’s helped her build a war chest but has also prompted criticism for being too close to Wall Street, especially following recent reports that she sought to gauge the interest of donors from the financial industry before launching a bid. She said Wednesday that those reports are not true. “I think it’s important for people to know that my values are never for sale,” she said, adding that she has banned money from corporate political action committees and will not take contributions from federal lobbyists. Asked Wednesday if she planned to try to change Cuomo’s mind, Gillibrand appeared undeterred. “I know a lot of people who love and respect him, and I’m one of them,” she said. Gillibrand will base her presidential campaign in Troy, a move that could highlight her roots.